Geology enthusiasts will especially fall for Badab-e Surt. Located in the Mazandaran province, the name comes from a combination of bâd, gas, âb, water, and surt, the old name of the village of Orost located 7 kilometers to the west. 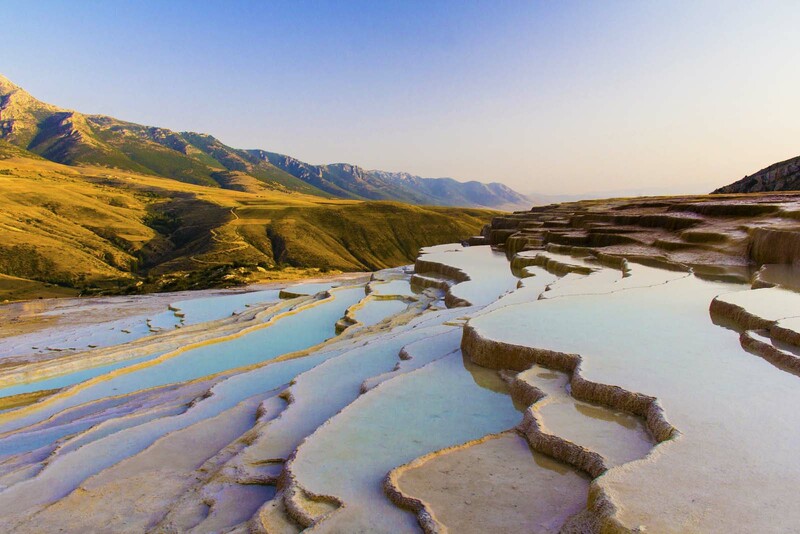 Although there are a handful of similar places on earth, such as Mammoth Hot Spring in the U.S. and Pamukkale in Turkey, Badab-e Surt is unique due to its distinctive orange hue, resulting from a concentration of iron oxide. Mysterious “Badab-e Surt Arvest” springs, meaning the intensity of the sparkling water are included of 12 completely different springs from the aspect of smelling and taste. The flow of the spring has made the spectacular stairways on a land with an area of about three hectares and has formed in the quaternary of geology. One of these springs which is the main fountain and has very salty water has a little pond that it is mainly used for swimming and water treatment (hydrotherapy). In one part of a floor of the pond, there is a deep hole is called the Bermuda Erost. 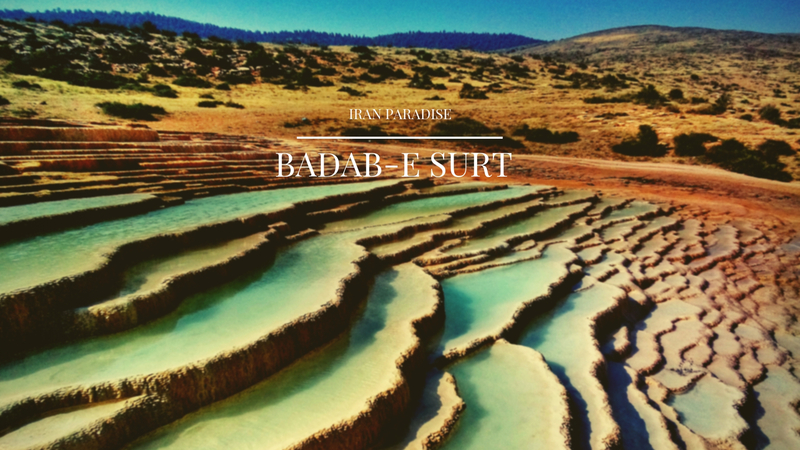 Badab-e Surt is a series of terraced travertine (limestone) pools – smaller than those at Turkey’s Pamukkale, but more colourful and serenely isolated within a mountain-ringed valley, 23km east of the Damghan–Sari road turning at Telma Dareh. 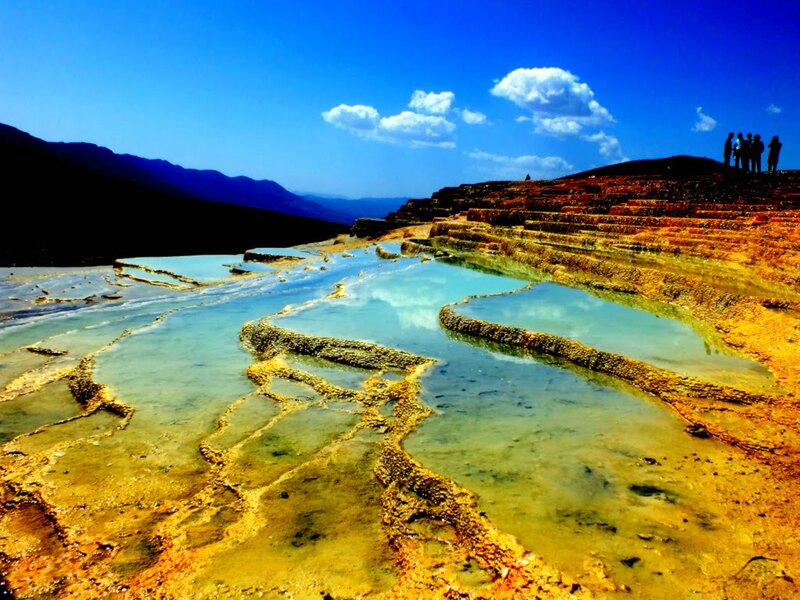 This travertine terrace sits at 1,840 meters (6,040 feet) above sea level and is the culmination of thousands of years of limestone deposited by water flowing from two mineral hot springs, which are thought to have medicinal properties on account of their high mineral content. As water reaches the surface, carbon dioxide degasses, depositing mineral carbonate. Because the heavier minerals settle at the top of the steps, the water becomes clearer as it flows down, turning this site into a dreamy, sky-reflecting staircase of mirrors that shifts colors depending on the time of day the sunlight glistens upon it. There are black sediments around the ponds which are beneficial for the treatment of back and legs, skin disease, Rheumatism and migraine. Due to the high salinity of the hole and consisting of a lot of minerals, there are no living creatures and the water doesn’t freeze on winters at all. The other 11 springs in the vicinity of this main spring are very small and are known as elixir of life. Its water has a little sour taste and is permanently have some gaseous leakage like soda. There are only six somewhat similar spring like Badab-e Surt in the world. Pamukkale in Turkey, Bagni San Filippo in Italy, Agoura El Hierro in Mexico, Bayshivaytay in China, yellow stons in United States of America and The Pink Terraces, or Otukapuarangi in New Zealand. If you want to take photos go there during sunset or sunrise, when you can see a wonderful view of light reflection on the ponds. The light reflection changes color in the ponds, several times, blue, yellow, red and brown! It may not be the most easily accessible site, but Bâdâb-e Surt is well worth the visit. About 370 kilometers from Tehran, two main routes from either Semnan or Mazandaran lead to this location. The Semnan route passes through Semnan city, towards Mahdishahr, Shahrmirzad, and Fulad Mahalleh before reaching Orost, the village after which the site is named. The more scenic of the two routes goes through Mazandaran and passes through Sari and the forests around Kiasar before arriving at Orost. From Tehran to Orost village, all the roadways are asphalt, but from Orost village to Badab-e Soort springs you will have to drive on a rough road for about 3 km. From the base of the mountain you have to climb about 3 km to get to the springs. You can also pay local people to take you up by trucks. We suggest climbing the mountain instead of the using the trucks. It is safer and you can enjoy the beautiful nature around too. If you want to climb the mountain instead of using the trucks, we suggest getting help from a local guide. With just a 15 minute walk you can see the wonderful springs, also you will be able to see a wonderful, impressive view of springs and mountains from the top. If you are a backpacker, it’s better not to stay in the village for the night because it’s a little difficult to find a local house for rent. There aren’t toilet facilities around the springs, but there are some small shops selling tea, dough, juices, cigarettes etc.